Do you love apples? 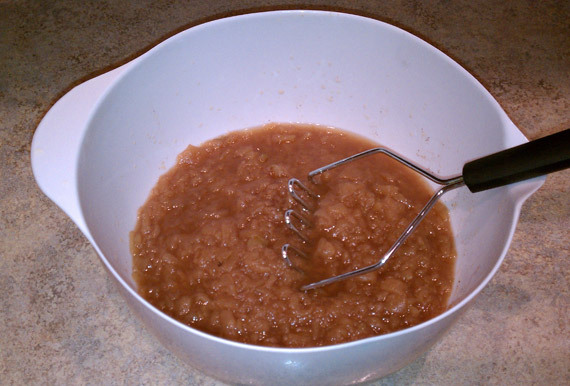 Aside from apple pie there’s probably nothing better than a bowl of fresh homemade applesauce. If you’ve never tried making your own applesauce you might be surprised to find out just how simple and inexpensive it is. Especially in the fall when you can get fresh apples for next to nothing at the orchard. 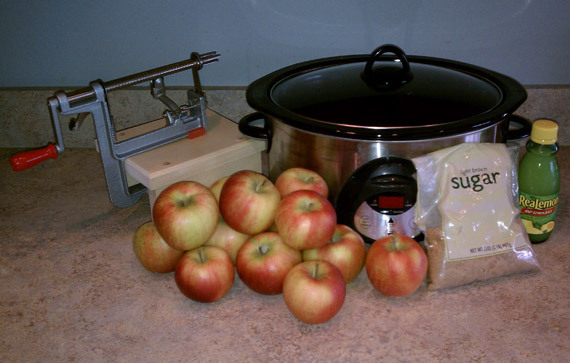 I know in the past we’ve bought a half bushel or so of apples and it’s a struggle to try to consume them all before they go bad, but making applesauce is a perfect way to not only make something delicious, but keep that fresh apple taste on-hand all year long. The good thing is that fresh applesauce will last a while in the refrigerator as it is, but if you’re into canning you can can your own jars of applesauce that will keep in the cupboard all year long. When you’re huddling next to the fireplace in the dead of winter wouldn’t it be nice to warm up a can of your cinnamon applesauce as a snack? It doesn’t get much better than that. While I’m not going to go through the canning process today, I am going to walk you through a fantastic homemade applesauce recipe that will only cost a couple of bucks and take very little time to make. Starting with the apples, really, you can use any apple that you like to eat. You can even mix and match apple types if you want. One thing to keep in mind is sweeter apples usually work better since applesauce is meant to be more sweet than tart, but you can always balance it out with more or less brown sugar if you need to. The one curious ingredient is the bottle of lemon juice. The interesting thing about the lemon juice is that it isn’t used for a flavor component at all. Instead, the acid in the juice helps keep the apples from oxidizing and it’s also essential for canning. If you’re just making a small batch to eat over a couple of days and don’t care if your applesauce turns a little more brown you can omit the lemon juice entirely. That’s also why I just use the cheap bottled juice since you’re really after just the acidity and not flavor, so why waste a dollar on a fresh lemon for just a tablespoon of juice? Finally, while not pictured, I recommend cinnamon. Obviously, a lot of applesauce doesn’t have cinnamon in it by default, but I love having some in mine because it comes out tasting like the inside of an apple pie! The only work really involved in making applesauce is peeling and coring the apples. No special tools required, but let me tell you, an apple peeler makes this process lightning quick. You can peel and core an apple in about 15 seconds! They are cheap and can be had for under $20 brand new, but they are also common items found at garage sales or in second-hand stores. In my opinion, they are a great kitchen tool to have because once you have one, you’ll be cooking with apples much more often. Not only that, but they work as great potato peelers as well. Using one is simple. 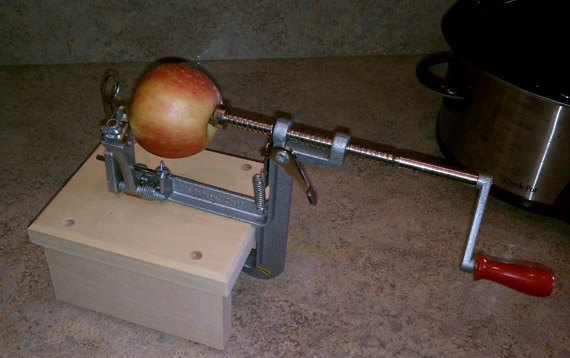 You simply stick an apple on the rotating shaft centered on the core. As if that wasn’t simple enough, the next step is to just turn the crank. Now that you have the peeling down, just work through all five pounds of apples. If you aren’t using a peeler like this you’ll just want to remove the skin, the seeds from the core, and slice the apple into somewhat thin pieces. After all said and done you’ll have a nice bowl of apples. Once you’ve peeled all of the apples it’s time to do some cooking. Here’s where you have another optional method. You can use a pot and cook on the stove top, or my personal favorite, use a crock pot slow cooker. 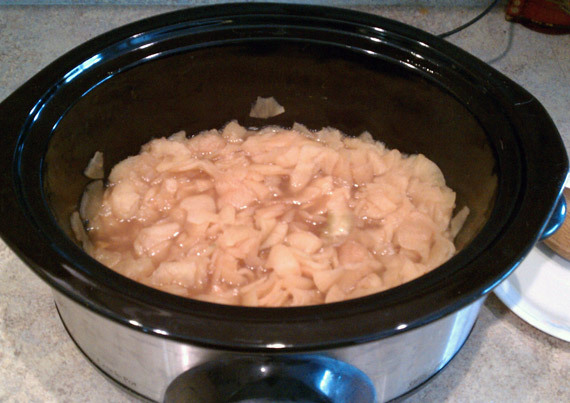 I like the crock pot because you have to cook the apples down for 4-8 hours, so it’s safer and easier to use one. As you may know if you’re a regular reader, I cook all sorts of stuff in my crock pot and one of my favorites is my crock pot pulled pork. 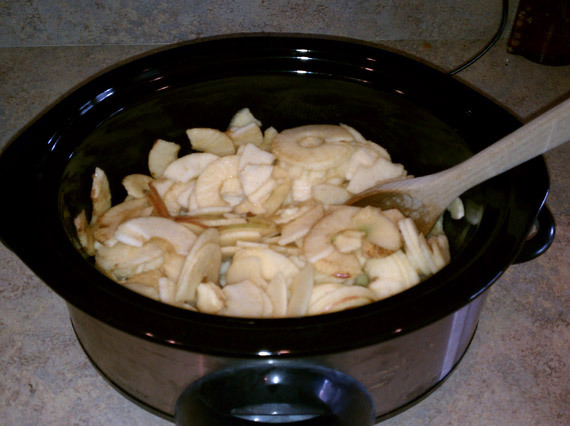 So, dump all of the apples into the slow cooker with about a half cup of water. If you have apple juice on hand, substitute that for the water. After adding the apples and water it’s time to add the few remaining ingredients. Start with a tablespoon of lemon juice. 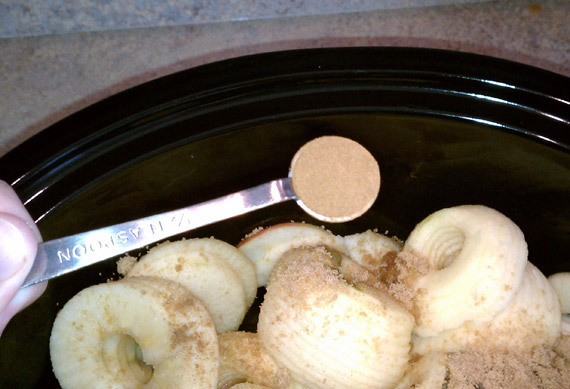 Next you’re going to add the brown sugar. For five pounds of apples I usually go with a half cup to start, but you can always do a little less or more to taste. It will really depend on how sweet your apples are. Remember, it’s always easier to start with a smaller amount and add more later. Easy enough, right? Finally, if you opted to use cinnamon like I did then you’ll go ahead and add that next. Again, I start with just a half teaspoon at first and then tasted it as it cooks to see if it needs any more. You can always add more, but you can’t remove it once it’s in there so go slow. Once you’ve added the few ingredients it’s time to let time and heat work its magic. If you’re using a slow cooker you can utilize either the low or high setting. Use low if you’re going to let it go overnight or otherwise for upwards of 8 hours. If you use high heat you can finish cooking in just 4 or 5 hours. If you’re using the stove you want to be careful and watch the heat. If it gets too hot on the bottom it can create a hot spot and burn some of the sugars, so play it safe and start slow. Use a spoon to basically stir and chop up the apple chunks. After a few hours you’ll start to notice some changes. The mixture will turn a little darker in color and really start to cook down. If I’m not cooking it overnight I’ll give it a good stir and chop the chunks up with the spoon every hour or two. After you’ve cooked the apples for the desired length of time you just need to dump them into a bowl and do a little mashing to get it to the consistency you want. You can use a potato masher, whisk, fork, or whatever you have available. The apples are so soft at this point it doesn’t take much to break it down. After all said and done you now have applesauce! Eat it while it’s still warm, chill it overnight in the fridge, put it on toast, the options are endless and I guarantee it’s better than any applesauce you’ve ever bought in the store. 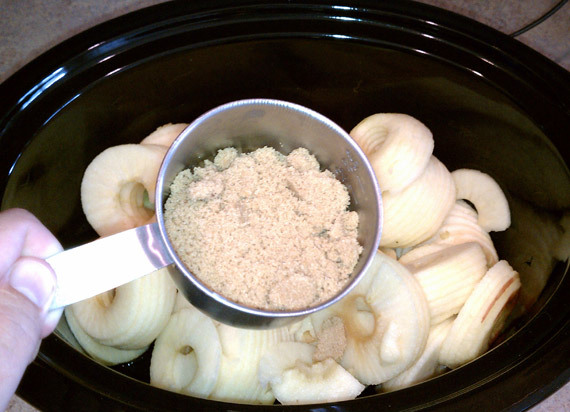 Have you ever made homemade applesauce before? 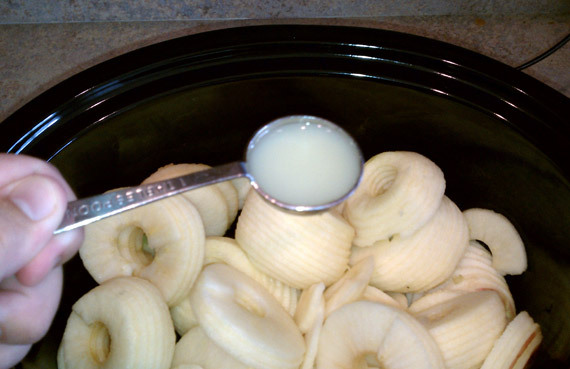 Have any special tricks or uses for your applesauce? I’d love to hear them. I’m fairly new to the whole applesauce scene so I’m always up for new ideas. in the beginning of this recipe you had mentioned 2 ways to make this recipe. but you only give instructions how to cook it in the crock pot. Jeremy: Ignore george's advice, to leave cooking to the professionals - most ridiculous thing I've ever heard! Cook away, experiment away, and post away! I like to see different ideas / approaches and learn from them! But I'm not a professional advice-giver, so what do I know? :) I'm excited to try your tasty recipe tonight! Thanks! 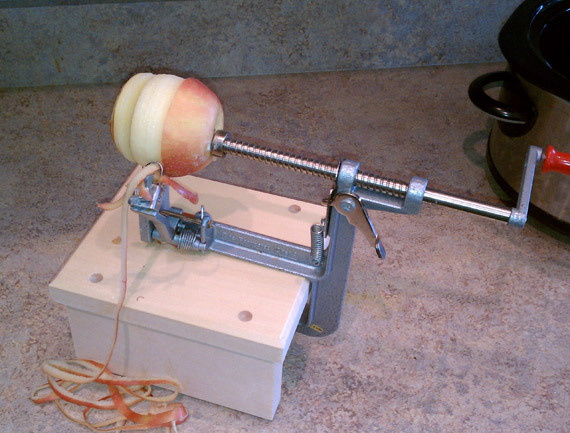 By the way - I adore my apple peeler. If any one is interested: there is absolutely no reason to have a pro apple peeler. I was pastry chef in a 5 star hotel and we never choose to use this. Besides, one will be become more skilled with a knife than just a peel remover. BTW, all that sugar is not necessary. Stick to finance, Jeremy and let us do the cooking! 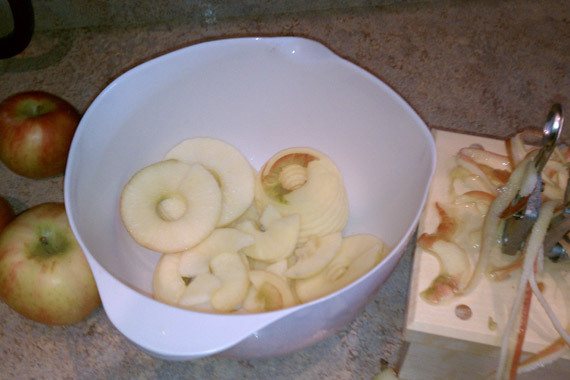 I've used this recipe to make apples -- but I just used one of those handheld corer/slicers that fit over the apples. That makes peeling easy, though I have to say the gadget is cool looking! Anyway, I love this recipe and will probably make some more soon, once temperatures return to cooler levels. 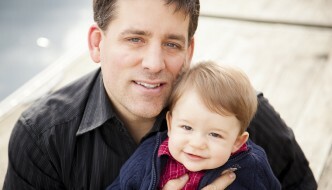 @Myra -- I was going to say something similar :) There are simpler methods and ones that don't require any sugar. I just chop up apples and boil them in a bit of water, skin and all, until they're they right texture. I'd love to try your method though. I don't use any sugar or lemon juice, and cinnamon is option. A few times I've added leftover fruit like peaches or raspberries too. 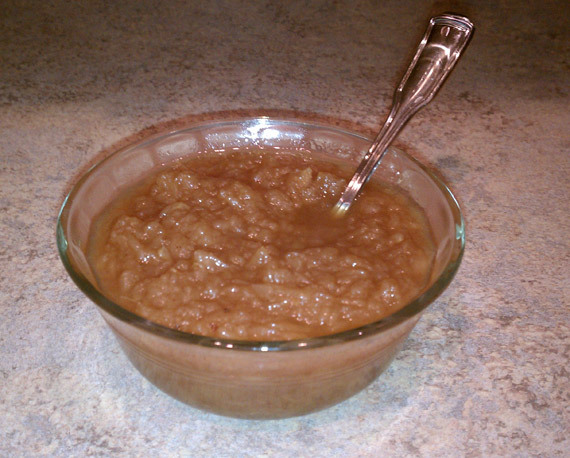 We just made applesauce over the weekend, but much simpler - we core apples (no peeling), throw the chunks in a roasting pan with some cinnamon and a little bit of water, roast at 350 for 40 minutes until soft, then throw it in the food processor. The skins get all chopped up, but you retain all their good vitamins and fiber. We just froze the applesauce, so no lemon juice needed.